As soon as you get your puppy or dog start to get her used to the car, using treats, talking calmly and generally making it a pleasant experience. It helps to have a second person to hold her the first few times. Comfort is a big thing, so make sure your dog can sit or lie down on a non-slip surface. Use a rubber mat or layers of newspaper with a towel on top. A light space like the car seat is ideal, not the footwell, as it is usually dark, smelly and noisy. Open the airvents and windows, but not too wide. If your dog puts it head out the window it can damage its eyes. Your dog must learn to sit or lie still and not leap around or try to get on your lap or shoulders. If she is used to a crate then use this when travelling to contain her. You could also use a box with high sides, but no top, wedged so it doesn’t move around. If your dog’s too big for this, then tie her to a seatbelt or door handle using a lead, preferably with a harness. (A collar could strangle your dog in an accident.) You can get special doggy seatbelt harnesses at some pet shops and vets. Long distance travelling needs more planning. Make sure you have water and a bowl and stop every hour to let her out to stretch her legs, relieve herself and have a drink of water. Cars get extremely hot in a very short time and dogs (and babies) have died in these conditions. There are exceptions to the rule, but then the car must be parked in the shade with all windows open and only for short periods while in your sight. If you have to do this (very unlikely), then the floor of the bakkie must have a fitted rubber mat or be treated with rubberised paint. She must be correctly attached to the centre of the front cab, using a harness and a short lead. Many a dog has fallen off a moving vehicle and been injured or run over. Being tied incorrectly could lead to strangulation, hanging, or being dragged along the road resulting in terrible injuries. Obviously this compromises your driving and could result in an accident. I have seen a dog being thrown from a car window while going around a corner. Fear of the unknown or a bad experience in or around a car may result in car phobia. Don’t force the issue, but rather try to get your dog used to the car in steps over a few weeks or months. First feed your dog near the car, gradually getting closer each day. Then feed her in the car with all the doors open. Once she’s happy with this routine try starting the engine, allowing her to jump out of open doors, but offering treats or toys inside the car. Once this is going well and she isn’t jumping out, then shut all the doors and windows and let the engine run for a couple of minutes while stationary. After that, try driving a few metres and then letting her out, and so on…. It will be a slow process, but the alternative (forcing the dog) will be traumatic, resulting in a more terrified dog around cars. Like in humans, some dogs are just more prone to motion sickness than others. Most puppies grow out of it and become more used to travelling and therefore don’t get sick so often. Motion-sickness is often associated with stress or fear, so make trips comfortable, short and fun for your dog. If car-sickness is a problem, don’t feed your dog for at least an hour before travelling (6 hours before a long trip). 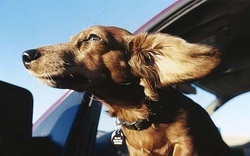 Open the windows, allow your dog to sit in the front (strapped in) with a view of the "horizon". Stop often for your dog to walk and drink. Drive slowly and, if there’s a choice, take a straight road rather than a windy one. Be prepared to clean up and make life easier by using a crate or box and lots of old towels and newspapers. Take lots of water bottles and perhaps some kind of cleaning agent that removes smells. For severe cases your vet may be able to prescribe medication for motion sickness. This can be a most annoying and ear-splitting problem for the other occupants of the car, not to mention that it may be dangerous. It is also a problem that is difficult to remedy without the help of a behaviourist and lots of patience. The reasons why dogs do this are varied: hunting instinct; protective instinct; fear of strangers/ motorbikes/ trucks coming too close to the "safe zone"; association with exciting walks; or just fun! * Use a chewy toy. Dogs can’t bark and chew at the same time, so giving her a nice big bone or cowhoof to chew in the car may help. * Close the windows and turn on some peaceful music. Sudden outside noises may trigger barking, so muffle them with some calm sounds. * Ignore the barking completely. Often we make things worse by joining in. * Contain her. Often a dog that barks from excitement or anxiety calms down when contained by a crate or a tethered harness.